Traditional American music wasn’t banned in the Soviet era, which allowed a local fanbase to grow. Today, Russian bands are making this music their own. Over the past two years, the Northern Kentucky Brotherhood Singers, R. Carlos Nakai, the Poor Mountain Boys, the Quebe Sisters Band and Modern Blues Masters all went on extensive tours of Russia. The tours — which were set up by the U.S.-Russia Bilateral Presidential Commission to introduce such traditional American music styles as Country-Western, acapella, Native American flute, and bluegrass — didn’t just create new fans of these styles. The performers often found Russians who were intimately familiar with traditional American music. Unlike jazz, which was banned in the Soviet Union, American country and folk music was available in Russia, and some songs in these styles are even featured in the soundtracks to children’s cartoons. Larissa Grigorieva, the producer and director of the Country Bridge Festival, said that while the fan bases may not be large, this kind of music is easy to like. The Moscow-based Red Brick Boys Music Band, formed in 2009, is the heart of the Russian capital’s community of bluegrass fans. In addition to giving concerts, the band members also give lectures on the history and development of traditional music of the United States. Their presentations include stories about the origins of traditional American music and live performances of old and new bluegrass music, sea chanties and folk melodies. “I like the tradition of an acoustic bluegrass,” said Alexander Dmitrienko, the leader of the Red Brick Boys, adding that its difficult to buy good acoustic instruments in Russia due to the fact that there isn’t a deep Russian tradition of acoustic music. 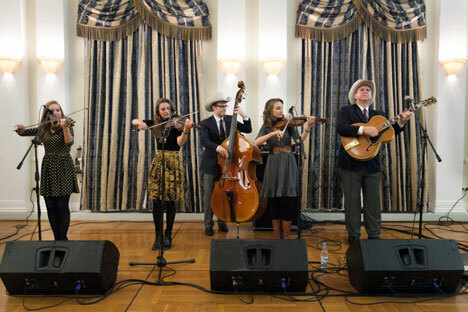 The U.S. Embassy in Moscow is active in bringing folk, country and bluegrass groups to Moscow. Commenting on the Embassy’s cultural activities, Minister-Counselor for Public Affairs Jeffrey Sexton said that the Embassy was bringing seven musical groups from New Orleans to participate in Moscow’s annual Usadba Jazz Festival in June. “This music will cover a wide range of styles, from jazz and blues, to Zydeco and gospel,” Sexton said. Already this year the embassy has hosted a bluegrass group that performed in Moscow and the Mary McBride Band, which went on a three-week tour of Russia. The Moscow group RawCats’88, which plays rock ’n’ roll, boogie-woogie, rockabilly and swing, will celebrate its 10th anniversary this year. The RawCats repertoire includes covers of classic American hits of the 1950s through the 1970s, as well as their own compositions, stylized after that period of time. Organizer and lead singer Valery “Injun” Setkin said that he has played rhythm and blues since childhood. “My father brought vinyl records from abroad and I grew up with American music,” Setkin said. Daniel Taylor of the Far Cities band said that the influence of the blues can be heard in a lot of Russian rock bands and that there is a lot of similarity between the storytelling of traditional American music and Russian bard singers. “I love folk music, but it’s more about the stories and I think Russia already has a very rich culture with bard music,” Taylor said. Few Moscow clubs consistently offer bands that play American-style music, although fans can seek out their favorite groups at a variety of venues in the capital. Members of local bands named at least five clubs in Moscow where they play (Bourbon Street, Radiocity, Roadhouse, Alexei Kozlov's club, club Dom). Music journalist Guru Ken said that country and American folk music didn’t suffer the same fate as jazz or rock because its fan base remained small. Ken noted that in the Soviet Union, the first folk music artist included in official airwaves playlists was Pete Seeger, whose politics were “ideologically close” to communism. Ken also pointed out that the most popular country music group in the Soviet Union was Mashina Vremini (Time Machine), which worked within the state musical organizations, so there was no need for the authorities to ban this kind of music.